Four shivery ghost stories best read during the dark fall hours. 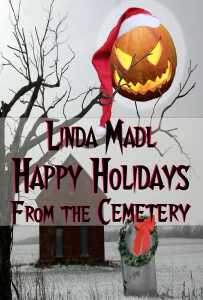 Happy Holidays from the Cemetery brings together time shifts along the Santa Fe Trail, spirits of Native American legends, gothic ambition, and evil lurking at the portals to the underworld. First, “Halloween at the Gates of Hell,” takes us to a Goth party in an old cemetery where the gates serve as a portal to the dark side. Beware of lingering where evil waits. “Trespassing Time.” Is our life a simple continuum of hours as we believe? Or is it a wrinkle in the universe? Perhaps a magic astronomical cycle discovered by the Mayans? A place where cities appear and disappear and – so can we. One old rancher knows the truth. Marty in “One Night at Whistling Woman Creek” discovers that more threatens her family’s welfare on the frontier than hardship and wild Indians … and it wants retribution. Finally, “Christmas at the Gates to Hell” a ghostly Christmas tree suggests spirits love the yuletide season, too. Can you survive the experience? Warning: Best read in a well-lit room.